Batman villains tend to have something in common beyond the criminal records - they're freakin' looney tunes. Oh, he occasionally gets someone that doesn't need a rubber room, but it's pretty rare. 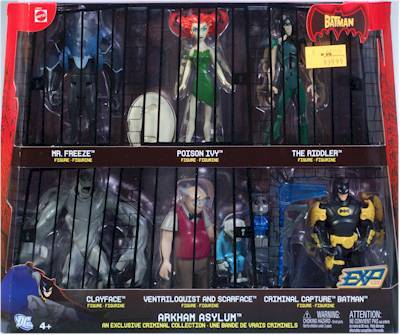 Since most of his rogues gallery spends their sabbaticals in Arkham Asylum rather than jail, it's no surprise that we've gotten not one but two boxed sets themed around the place. This new one is from Mattel, based on The Batman show, and includes Mr. Freeze, Clayface, Riddler, Criminal Capture Batman, Poison Ivy and the Ventriloquist/Scarface. Four of these six figures are just repacks of already released characters. I don't see anything new about Riddler or Clayface, and while I didn't have a Freeze handy to compare, I'm not seeing anything here that seems different. Mine has the first release Clayface face, and the smooth Freeze face, although I suppose there could be sets out there with the variant faces. I haven't heard any reports of that though. There IS a variant to look for, and it's with Scarface. 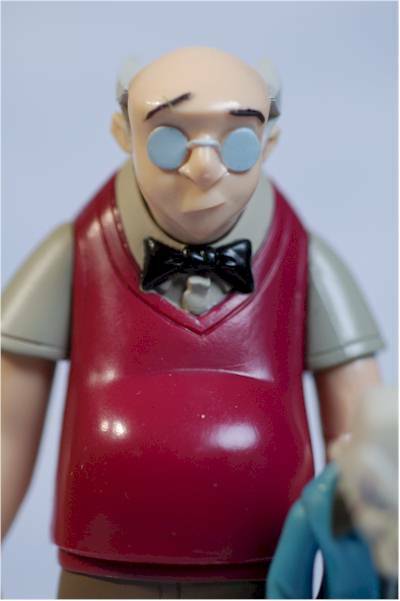 Most of the sets come with the normal puppet, but there are some that come with Mr. Snoots. Keep an eye peeled if you're interested. The set is a Toys R Us exclusive, and runs a whopping $40. The new villains in the set, Ivy and the Ventriloquist, are also being packed into two different three packs for Target only, running $20 each. Those Target three packs are popping up right now as well. Since four of the six figures are rehashes, two of which I've actually reviewed before (Clayface and Riddler), I'm focusing this review on Ivy and Ventriloquist. When it comes to "Value", I'll be grading on the price you have to pay to get both figures, $40, whether it's in the three packs or the six pack, and in the "Accessories" section I'll mention what comes with the full six pack. This isn't quite as cool as the folding box we got with the original Batman Animated Arkham Asylum, but it's still a great idea. The bars on the cover don't block your view of the figures too much, and the thin size matches up with other recent multi-pack releases. There's also some decent text and a great line up style photo on the back. Both figures sport nice sculpts for mass market figures, matching up fairly well with the source material. 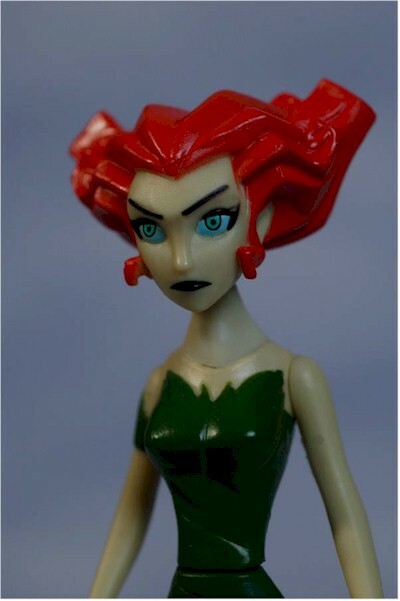 Ivy has a terrific head sculpt, and I love the way they captured the hair. She's also in scale pretty well, and while she has itty bitty feet and a big head, they threw in a base to allow her to stay standing. The sculpted pose looks terrific, and the sculpted hands are designed to look good rather than hold accessories (since there aren't any). Her only real downside is the arms, which are made from plastic so soft, she makes Clayface look stiff. I said "look stiff", not just "stiff" - the latter goes without saying. These floppy arms are really annoying, at least to little old me. 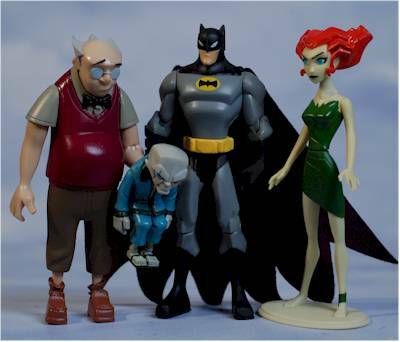 The Ventriloquist and Scarface are terrific, as long as you like The Batman designs. This isn't the old BTAS, 30's gangster look, but rather the newer pimp daddy appearance. Most of us are just so damn happy to get these two in plastic form that if they looked like Shari Lewis and Lambchop we wouldn't complain. Well, at least not too much. The sculpts are some of my favorites of this line so far, and they came up with a good way of attaching Scarface, yet allowing him to be separate if you so wish it. The wrist of the Ventriloquist's left arm is actually a peg that fits into the back of Scarface, and he can pop right off. It means that the Ventriloquist figure looks a tad odd without the puppet, but the puppet can be used elsewhere if you so desire. My only issue with this pair is one of scale. The Ventriloquist is awfully large, both in height and in girth, compared to Batman or other villains in the line. It's so off that he really looks in a different scale to me when standing next to Batman. 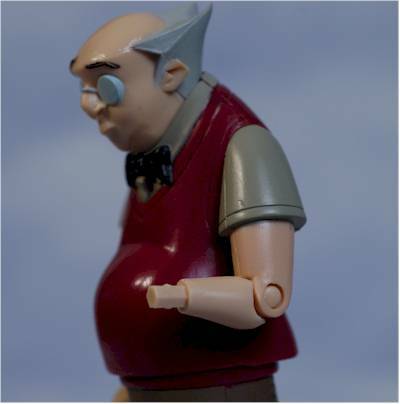 There are a number of other common issues that you see in mass market toys, like mold lines on the Ventriloquist's arms, but they are pretty common for this price point and type of market. If these were specialty market toys, I'd be far less forgiving. The paint ops on both figures are pretty clean, but still are clearly mass market quality. Ivy has noticeable variation in skin color from her body to her face, and while her eyes are terrific, there's some slop around her clothes. There's less slop on the Ventriloquist, but enough on Scarface to make up for it. 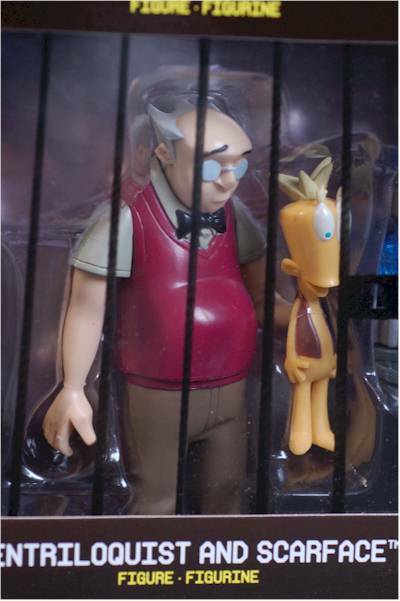 There are also a number of parts simply cast in the color plastic, like his sweater, making them extremely shiny compared to other parts of the character. The articulation is extremely basic, but not surprising considering the overall articulation of the line. Ivy has a cut neck, cut shoulders and cut waist. A little more arm articulation would have been nice of course, and a ball jointed neck would have been great. The Ventriloquist has the same, with an added pin joint on his left elbow. This allows him to raise and lower the puppet. The disappointment here is that there was potential for so much more articulation between the two of them, and it actually looks like there are some additional joints. I tried getting his ankles to turn where they enter the pants, and his arms to turn at the bottom of his sleeves, but no luck. Scarface is even a bigger disappointment, since it LOOKS like he has a ball jointed neck, cut shoulders and cut ankles, but I couldn't get any of them to turn. They appear to actually be glued in place, but if you do get yours freed up, I'd love to hear about it. I would like to point out that neither of these new figures has an 'action feature', something that has hurt some of the other figures (*cough* Temblor *cough*) in the line. This is not a set to buy for the accessories, that's for sure. 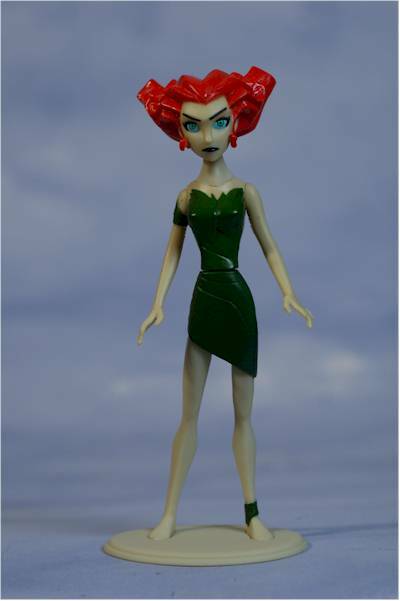 Ivy has a small plastic base, done in a color that matches her body. That's nice, since she really does need it to stay standing for long periods, but it's still mighty light in this category. 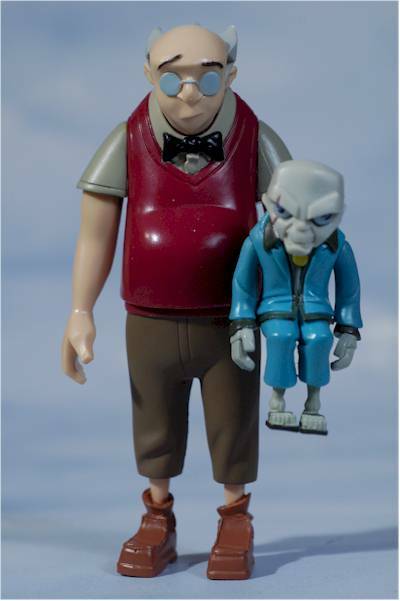 I suppose you could count Scarface as an accessory to the Ventriloquist, since he is a removable puppet. But this is a villain that really requires both characters to be there. It would have been nice to get both Scarface AND Snoots, and then one of them would have counted as an accessory. The only other accessory in the entire set is Criminal Capture Batman's 'gun'. If you know a kid that loves the show, and doesn't already own the other villains, than this set is a terrific gift. He gets a bunch of cool baddies (and one not too goofy Batman) in one shot. Unfortunately, it's not a particularly great set for kids, since most of them are going to have at least some of these villains, and parents are going to be uninterested in paying this kind of money if their kids already have any of the figures. This is clearly a set intended for collectors much more than kids. The huge problem with this set - and the three packs - is that you're getting stiffed on price. In either case, you're paying close to $7 for a 5" scale figure with no accessories. On top of that, you're forced to buy two additional $7 figures that odds are pretty good you already have for each new figure that you don't. Of course, you could say that these are 'exclusives', which means fewer made, which means higher prices. But that argument starts springing more leaks than the Titanic when you realize that it's 'exclusive' to TWO of the three major toy retailers. Now, I have my suspicions that this is not Mattel's fault. My suspicions tell me that Target and Toys R Us picked up these as exclusives and are the ones going with the ridiculous mark ups over their cost. I suspect that based on their past pricing of other exclusives from other manufacturers, and because it appears that Mattel is trying to keep prices down on other lines, rather than drive them up unnecessarily. Obviously, if you want Scarface or Snoots more, you should be paying attention to who is in the box. Otherwise, there's not much to worry about. I've reviewed many of The Batman figures, and have been buying all the new characters as they come out. I don't get to watch the show regularly, but from what I've seen, it's improved consistently since the rather rocky start. 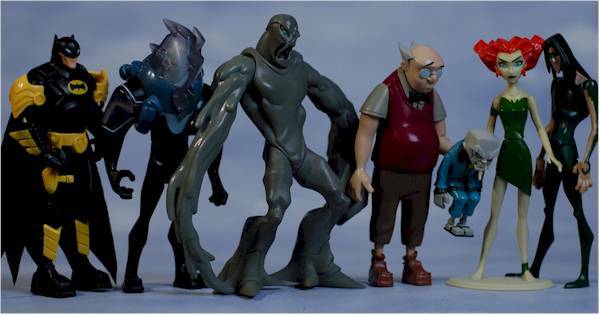 And the figure line has had some real hits, like Man-Bat, and some real dogs, like Temblor. Had these figures been packed singly, with a couple of accessories, both would have scored much, much better. 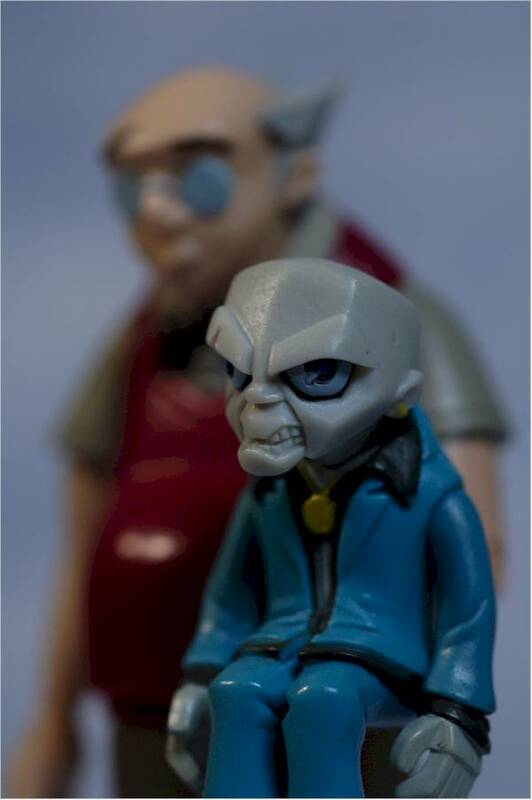 The sculpt and paint on both are great, and the Ventriloquist and Scarface (despite the scale issues) are probably my favorite figures of the line now. If either of these figures were carded on their own, the scores would go up. Assuming Ivy and Ventriloquist came with something additional on their own, she'd get *** easy, and the Ventriloquist is a ***1/2 star figure. Boosting the Accessory and Value scores would boost these two figures up to where they ought to be. However, that's not the case. While you're technically only paying $7 a figure, the reality for most collectors (and parents!) is that you're paying $20 each for Ivy and Ventriloquist, and that simply can't be ignored when assessing them overall. This set is a Toys R Us exclusive, or you can pick up the Target exclusive three packs that will contain these two figures as well (one in each three pack of course). The Target sets are just now hitting shelves as well. - the most recent review covered the Temblor. - There's also Killer Croc, Clayface, the Riddler, Firefly, the Penguin, Bane and Man-bat, the regular Batman, Bruce Wayne, and Joker, and the 10" rotocast version of Bats.